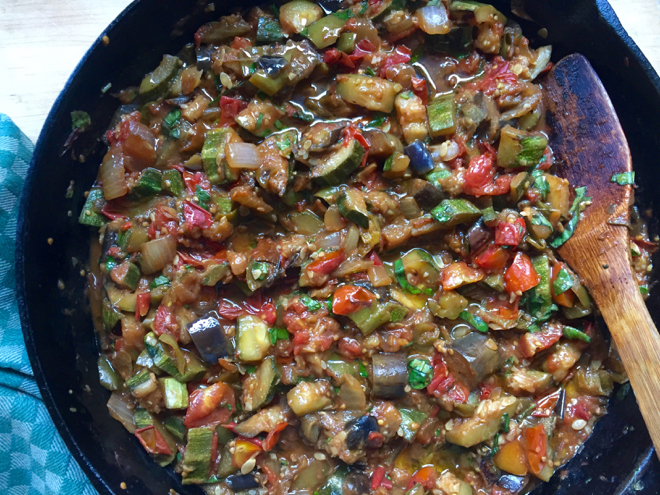 I love the time of year when I can make ratatouille, when sweet peppers, eggplant, summer squash and tomatoes are all at their peek–usually beginning early August and lasting until mid-to late September. In my cook-with-what-you-have version quantities are easily adapted and the ratios are not critical so scale up or down as needed. It is important to cook some of the vegetables separately so that you don’t crowd the pans and steam them rather than sautéing them. You want the browning and sweetness that comes with direct contact with the hot skillet. It is a rich, stew-like dish in which the vegetables all break down a bit. It is not beautiful but it is GOOD! Serve with some good crusty bread, another salad, a frittata or some such. It’s even better the next day and delicious at room temperature as well. Heat some olive oil in two large skillets over medium-high heat. Add the onions and peppers to one pan and the zucchini to the other. Sprinkle all with a bit of salt. Cook both on high heat for a few minutes, stirring frequently and then turn down to medium high and continue sautéing until softened and browning just a bit. When the zucchini is just about tender remove it from the pan and reserve. Add a bit more oil and add the eggplant and a bit more salt. You can keep the peppers and onions sautéing on medium while the eggplant cooks. When the eggplant is tender and browning, add half of it to the pepper and onion pan and divide the zucchini between the pans–or if you have space put it all in one pan now. Now add the tomato to both (or just the one pan) and bring to a lively simmer and cook for about 10 minutes to marry the flavors and soften the tomatoes. Add the garlic and basil and cook for 2 more minutes. Taste and adjust seasoning. Serve warm (but not hot) or at room temperature with a drizzle of good olive oil.